Professional artists of all kinds can take tax breaks. 1. Can Homeschoolers Qualify for an Educator Expense Deduction? 2. Can Clothing Costs Be Deducted on Tax Returns? Being a professional artist means dedication to things like exploring the mind, interpreting society, making a visual political statement. It does not leave a lot of time for understanding the tax code. Nonetheless artists -- be they a painter, a dancer or writer -- pay taxes too. Understanding at least some of the code allows artists to take advantage of tax breaks associated with any other businesses. The Internal Revenue Service says expenses resulting from business travel are tax-deductible, as long as the artist is far enough away to make it inconvenient to return home at night. For instance a painter can deduct the cost of meals (though only half), a table at an art fair, visits to a gallery, hotel expenses or the opening of a show. Artists can also use what’s called the IRS “meal allowance.” Instead of tallying receipts for meals, they can deduct up to $71 per day for meal expenses depending on where they are. The IRS sets an annual rate based on how expensive a location is. New York City, for instance, would be considered a “high cost” location. As long as the travel can be substantiated as related to business, it can qualify for tax deductions. Deductions can also be taken for meals that relate to the business side of art but are closer to home, such as a painter meeting a gallery owner. 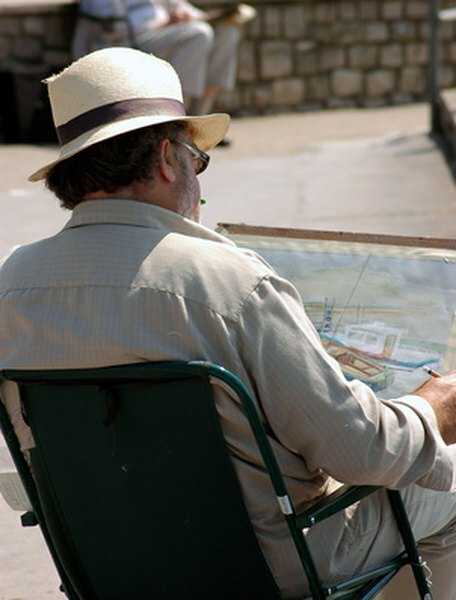 Tax breaks for the use of a vehicle can be one of the largest deductions an artist can take. This can be done in two ways. The first is by taking the standard mileage allowance of 55.5 cents, the rate set for 2012. So, a ballet dancer could deduct the trip to an out-of-town performance as long as he or she keeps track of the mileage. This allowance rate does change every year, and sometimes more than once a year, so it is wise to check with the IRS before filling out the tax return. An artist can also depreciate a business vehicle’s cost over five years. This figure can be added to the costs of maintaining the vehicle, such as insurance, repairs and gas. The home office is a valid tax deduction for artists, though it hasn’t always been. The IRS allows a deduction for a room used for the sole purpose of their business. For instance, If a cellist uses a room only for practicing, storing instruments and giving lessons, they can use Form 8829 to calculate the square footage of the home that can be designated a business space. They can then deduct that percentage of the rent, mortgage interest, utilities, real estate taxes and some other items. Keep in mind that the office must be used solely for business purposes, therefore an office space inside the dining room doesn’t work. This would be considered a mixed-use space. Equipment, normally defined as tools that last more than a year, can be depreciated over five to seven years. This is tracked on Form 4562 and might be used by a potter to depreciate a kiln, for instance. This type of equipment differs from the clay or paints used by the potter, which would be deducted in the year they are purchased. There is also another tax strategy known as Section 179 in the tax code. This allows an artist to deduct the full amount of that kiln all at once. The only catch is that the item must be $500,000 or less. Artists can also deduct for items others can not. For instance, a musician can deduct for a new recording and a dancer could deduct for tickets to a show. Both of these would classify as research. However, the IRS does scrutinize these items, and won't allow deductions it considers lavish or extravagant. And one more thing, it's important to determine if indeed you are a professional artist or hobbyist. Only if you are pursuing your art with an intention of making a living at it can you fully deduct your related business expenses.